A few fun products and techniques will transform your crafty world! Today our designers will share how they created gorgeous, petite-sized projects for their home…all with just a handful of Prima + [re]design products®! For the home-made candle I used an small Mason Jar. I painted it first with black chalk-like paint and then with grey chalk-like paint. I used some embellishments created with the Redesign Mould™ - Warrington Framework . I also applied a coat of the gorgeous Redesign Wax Paste™ - Eternal. “I painted the sides with Art Alchemy - Metallique Acrylic Paint in Soft Satin, but it was too shiny for what I wanted to create, so I used a wash of white gesso over it. I used the Art Alchemy - Metallique Wax - Bronze Age to enhance the details. Next I created a napkin to go with it. I mixed my Art Alchemy - Metallique Acrylic Paint in Soft Satin with Folk Art Textile Medium and painted it with a dabbing brush over the Lenore Corners Stencil." Jaya’s here with a breath-taking altered charger plate. With deep, rich colors this will make any table setting look exquisite! All she used was black Impasto paint (for full coverage over the charger and moulded pieces), then added a touch of [re]design wax™ to catch the details. Simple, yet STUNNING! How gorgeous is this altered candle? Miranda chose a few [re]design with Prima® products to take a plain Jane, inexpensive candle and holder…and turned them into this stunning French country piece! Make your mantle stand out with this gorgeous decor. Altered books are all the rage! They’re inexpensive and create beautiful decor pieces. 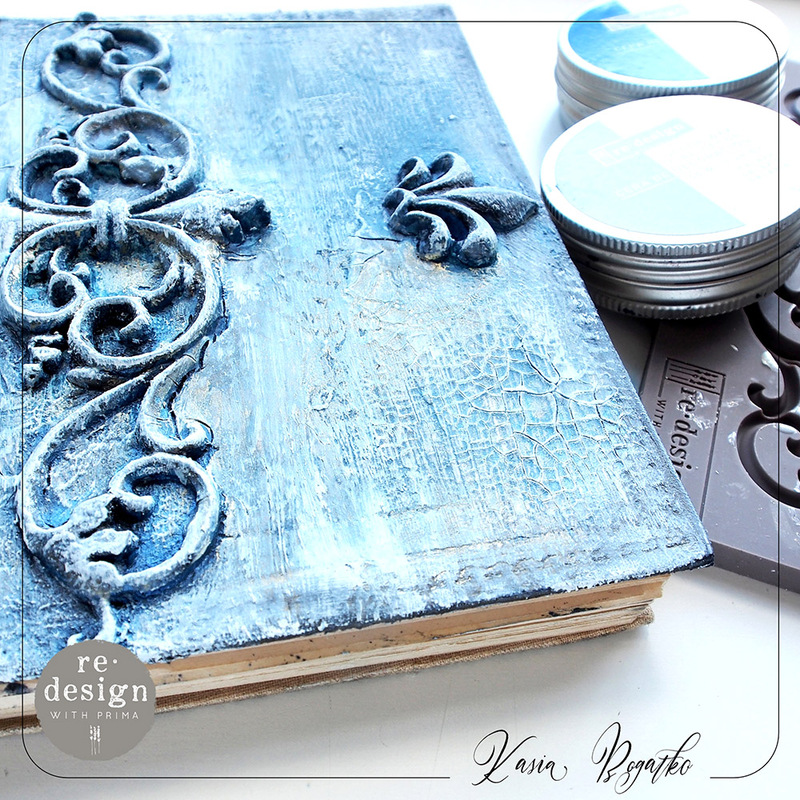 Kasia chose a beautiful blue palette for her altered book, then highlighted the moulded pieces and crackled effect with a touch of white gesso to soften the look. A beautiful vintage touch can be achieved with just a few products! This altered frame by Anita is simply scrumptious! Here are step-by-step instructions! Start with a old canvas frame and paint with gesso. Use the moulds and paper clay to decorate the frame. Apply moulded pieces to frame with glue. Paint with plaster paste to smooth out edges. Use the grey and cream paints from Texture Fantasy Paste (Old Walls) to paint each colour to desired look. Add [re]esign decor wax in eternal to the moulded clay pieces, just on the raised edges. Use thick cardstock for the size of the frame, apply transfer to center, and then paint with clear gesso so your transfer is sealed. Adhere the cardstock to the back of frame. If you’ve been wanting to dabble in DIY, but didn’t know where to start, our DIY petite ideas are the perfect bite-size projects to try first. Once you get the hang of these amazing products you’re going to want to start decorating your whole home! Now which [re]design with Prima® product is on your wish list?